Here at UK Top 40, we are very sad to announce that sadly, the singer Andy Williams has passed away at the grand age of 84. Reports have stated that the legend that is Andy Williams died peacefully at his home in Missouri on Tuesday 25th September, having battled with bladder cancer for many years. Mr Williams exposed that he had been battling with bladder cancer since November 2011. He declared that he would return to the stage after beating the disease, vowing that the cancer was “no longer a death sentence”. Unfortunately, a representative for the singer has now confirmed the news that Mr Williams succumbed to his illness. Having stormed the charts with his first single back in 1953, he then went on to release 3 Platinum albums and 15 Gold albums! Altogether he recorded a grand total of 42 studios albums and was recognised as one of the most popular vocalists in the swinging sixties. Not only was he a legendary singer, but he also thrived on running his own theatre in his home town ‘the Andy Williams Moon River Theatre’ – named after the renowned track. 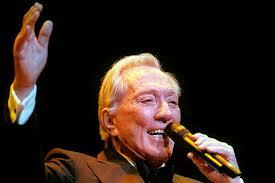 He also excelled in his very own TV series ‘The Andy Williams Show’ of which won three Emmy awards. In the UK, he most recently released a hit single with Denise Van Outen ‘Can’t Take My Eyes Off You’ in 2002. This was a re-recorded version of the original and reached number 23 in the charts. This entry was posted on Thursday, September 27th, 2012 at 2:24 pm	and is filed under Music News. You can follow any responses to this entry through the RSS 2.0 feed. Both comments and pings are currently closed.